Your PC most likely sports a processor that has multiple cores. Or, it may have more than a single processor. You should confirm that Windows is taking advantage of the extra processing power by setting the number of processors available to Windows. Press Win+R to bid the Run dialog box. In the System Configuration window, click the Boot tab. The BOOT Advanced Options dialog box appears, as shown. Place a check mark by Number of Processors. Choose the highest number from the menu button. The highest number is coincidentally the number of processor cores inside your PC. 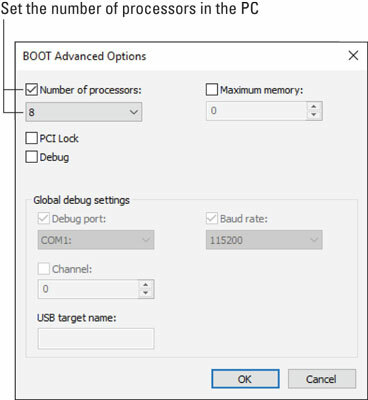 Click OK to close the BOOT Advanced Options dialog box. Click OK to close the System Configuration window. Windows restarts so that the changes will take effect. Set the number of processors here. The performance boost in your PC from setting the proper number of processors may not be noticeable, at least not dramatically. But at least by following these steps, you ensure that Windows is using the PC’s hardware better than it did before. • To confirm that the change has taken hold, repeat Steps 1 through 4. If the number of processors set remains the way you changed it (in Step 7), then it worked. • This modification doesn’t physically alter the number of processors inside the PC. It does, however, direct Windows to use them more effectively.